If you've opened this page, then you must be somewhat curious. For 2011, I've created a new batch of business cards from Vistaprint that were blank on the reverse(with the exception of their ad blurb.) After passing out a few dozen cards with little or no response, I decided to add some artistic flair--a nugget of my aesthetic style. 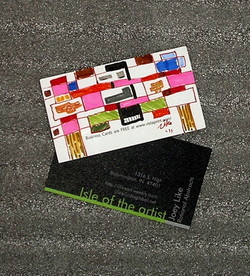 So when you see one of my business cards(they'll have "Isle of the Artist" printed on front), flip it over for an amusing surprise. if you have a camera phone or scanner, I encourage you to take a picture, upload it to the web and share it socially. Post it on your fridge, stuck it in your car visor. Heck, get it framed and put on you desk! All that I ask in return is that you kindly tell others where you got it and where to find the artist. Thank you, and Happy Hunting! !